Do you know how do you login to your Google account on a computer? If you type your username and password, a key logger could capture them and save them. If you’ve a phone or a tablet, you can follow the better following ways. • First, it is required to visit to accounts.google.com/sesame on your computer (Open Sesame helps you remember the address) and you'll see a QR code for a special URL generated by Google. • Then, you can use a reader app like QR Reader for iPhone, Barcode Scanner for Android, Google Goggles, Google Shopper or Google Search for iOS. 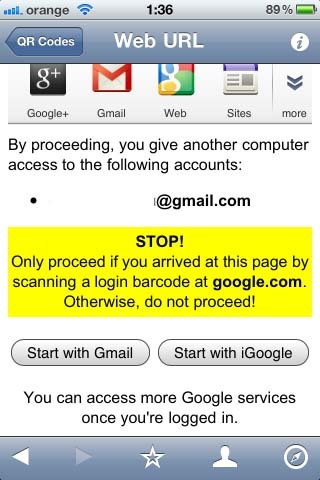 • Now, scan the QE code on your phone or tablet type the username and password of your Google account. • After that, you can click click "Start with Gmail" or "Start with iGoogle" and the corresponding service will automatically load in the desktop browser.